After starting my travels at 3:45 am on the 5th and ending at 6:00 pm, I was ready to get on with the trip. However we’ve started off the trip with a bit of a delay. We were due to leave at 6am this morning, but have been delayed til 5 pm. This is due to strong winds that are causing large waves, making travel and the survey work difficult. However, today hasn’t been a waste for me. I’ve had a chance to take in the town of Woods Hole, Massachusetts. This place seems like the hub of Northeast Atlantic fisheries. There several organizations working out of Woods Hole, and there is a rich history of ocean exploration that is evident throughout the town. Three institutions that are working out of this area are NOAA National Marine Fisheries Service, Woods Hole Oceanographic Institution (WHOI), and Marine Biological Laboratory (MBL). Each of these institutions serves its own purpose and there is not much overlap between responsibilities even though they are working in the same field. These institutions do collaborate somewhat with resources and people on missions, but typically don’t work joint missions. The fisheries branch of NOAA is typically more concerned with the populations of marine life. WHOI is more focused on oceanographic studies, more about the physical and chemical characteristics of the ocean. Marine Biological Laboratory, as the name implies, is also focused on the study of ocean life, but unlike the other two organizations, it is a college and is associated with the University of Chicago. MBL typically does not collaborate with NOAA as much as WHOI does. On this particular scallop survey, A scientist from WHOI is working with the HabCam (which I’m sure to talk more about in future blogs). Woods Hole seems like a destination for any aspiring marine life or oceanography college student to come and work with the best in their field. There are several graduate and undergraduate students on this trip as well. As I get to learn everything needed for this trip to function, I’m starting to realize how many different specialists are needed on this mission. The collaboration and coordination of this trip by the team at NOAA is really impressive. Got a science background? Not sure what you want to do with it? Why not try a NOAA cruise? You can click here to learn more. Left to right: NOAA offices, A WHOI laboratory sign, and an MBL building. Looking at the projected weather forecast and imagining being tossed around by 12 foot waves has me hoping this anti-seasickness patch will work. By the time I have finished up this blog post, we are underway, and I am feeling okay still. Looking forward to tomorrow, being part of the first dredging team. I am amazed to hear the waves pounding against the ship. Forces of nature are an awesome thing to deal with. Wood’s Hole, Massachusetts (where we launched from) is where the main ferry to Martha’s Vineyard is located. This makes Wood’s Hole a tourist destination for people who are wanting to go see the popular summer getaway of Martha’s Vineyard. Interesting mix of research and tourism here. We have pulled up some impressive loads of scallops so far on this trip! Our largest load included 2,083 scallops (which is about 750 lbs). When they come up in the dredge you can hear them coming. They clatter in the net as they get hauled out and dumped out onto the deck. But even when we are so tired of counting the scallops and lifting the heavy baskets, the scientists and crew members have said, “Just wait! You haven’t seen anything yet!” referencing the fact that there were many more scallops to come. But today, in a location where in years past have been home to a large numbers of scallops, we didn’t find many. In fact at our last station, there were only five. Instead, the net bulges with the sea star, Astropectin. “Where are all the scallops?” is a question that the scientists keep asking themselves because this data is so surprising to them. Today we passed many fishing boats, in fact at one point there were at least five on the horizon surrounding us. I had thought that was an important clue that meant we were bound to find lots shellfish, but that hasn’t been the case. Because this data is surprising, it has the scientists asking another question “Is there a problem with the collection gear?” Fortunately, there are many systems set in place to guarantee that everything is working properly. During experiments at school, we try to make sure that students know to standardize the procedure and limit variables so that they can be sure the results they attain are based on the one variable they isolated and not due to some other environmental factor. That principle couldn’t be more true on this scallop survey. It is of the utmost importance that all the data that is collected, is collected the same way at each location, and as it was collected in previous years. For this reason, all the specifications about the dredge (the size of the dredge, the size of the rings that let small organisms out, but trap the larger organisms) are kept the same throughout each leg of the survey and each year. In addition to this, they also measure the angle of the dredge with an inclinometer. This way they can make sure that the dredge is always in the same position as it moves along the seafloor. The tow is always for the same length of time, going at the same speed, and going in a straight line. You can see that if a tow was down for a longer amount of time that would change the amount of organisms being caught. To double check all of these procedures, we mounted a camera on to the dredge. This camera had a timer on it as well. It was really fun to watch the video; the dredge fell through the water column and then settled on the sea floor in a puff of mud. The dredge sped along the substrate and we could see little sea stars falling back into the net. Watching the footage, the scientists were able to double check that the angle on the dredge and the amount of time it spent on the bottom was consistent with the measurements they were getting from the inclinometer. Since this data is helping to manage such a valuable economic resource, the scientists need to be extremely confident in the data collection methods. Using this data, decisions will be made about the fishing regulations in the area which ultimately impacts people’s jobs and income. Because these scientists have carefully and deliberately eliminated so many variables they can be sure that their equipment is working properly and that they can trust their data. But that still leaves the question, where are they scallops? Have all of the scallop fishing boats that we can see in the distance totally wiped this area clean? Or is it to do with the incredible numbers of sea stars that we have seen, gorging themselves on their favorite delicacy? Hopefully, this particular region is isolated and we will have been luck finding scallops tomorrow. Jack C’s question was, “Did you catch any sharks?” And yes we have! We have caught a bunch of a small type of shark called a chain dogfish. They have a very cool pattern on their skin that looks like a chain link fence and they are usually around a foot or so long. We also caught a shark that was a little bigger called a smooth dogfish. What is great about these guys is that they are a little more resilient that some of the other fish that we catch. They make it back to the water without a problem and we watch them swim away. My patrol of the bow of the boat certainly paid off today. I saw so many dolphins! The past couple of days I have been in awe of the handful of dolphins we have seen and by the sunfish. But, honestly, I was a little surprised that we hadn’t seen more mammals. Well, the dolphins found us today! On and off today, dolphins would stop by the boat for a few minutes to play in the wake or up near the bow. They would leap and splash a couple of times and then be on their way. It was a different species than the dolphins that had visited us at night—these were grey on the top, then a tan color on the sides and white underneath. This afternoon a couple were near the back of the boat when we had a break between hauls. Knowing that the dolphins especially like to play near the bow of the boat, I went to see if maybe some of their friends were up front. Sure enough, surging through the water, weaving between each other were at least a dozen dolphins. Then I happened to look up—and there coming towards the boat were even more dolphins. They were porpoising through the water coming from ahead of the boat. You could see them coming from at least a ½ mile away by the repetitive, white splash of the water. It was like a dolphin convention was happening at the Sharp! They would meet each other at the bow and enjoy being pulled along by the drag in the water created by the ship. Probably the most amazing part was not only watching them but listening to them as well. Because they were so close, just about 12 feet below me as I stood on the deck of the ship, I could hear their clicks and high-pitched whistles. Watching their fun dance in the water, I noticed that many of the dolphins would swim for a few seconds together, belly to belly. Then they would speed off and find a new dance partner; I thought it was very sweet and adorable. It took me a minute to figure it out, but then I realized that they were doing a little more than just “dancing” together. Oh….They were truly enjoying themselves! I didn’t realize how long it had been since I had watched the sun set. Not just the casual, driving in your car and you notice the daylight fade, but when you sit down with the intention of taking in a real sunset. When you watch from the first signs of an orange sky until the last smidge of brilliant red slips gently down over the horizon. I had the chance to watch one of those sunsets today, start to finish. It reminded me of summers out at the Shoals Marine Lab when we would actually stop teaching class just to sit out on the porch and admire something that happens every day, but is nevertheless spectacular. I am always surprised how quickly it happens. All day long, it is impossible to notice our movement relative to the sun, but it only takes a few minutes to transition from day to night. And the real highlight is not the exact moment that the sun disappears, but minutes after the sun has set, when the entire sky glows red. Tonight was the first moon that I have seen on the trip, and it was curved into a smile hanging in the sky. It grinned next to a bright star (or maybe a planet?) on the pink backdrop, above the midnight water with a large tanker drifting by in the distance. One of my favorite parts of this adventure so far is just being able to spend all day outside. I wake up in the morning—usually around 9:00 (I haven’t slept in so late since before Madelyn was born—but it is because my night shift ends at midnight—and maybe because the gentle rocking of the ship helps me sleep so fitfully!). I hurry to get dressed and then head right for the bow of the boat. There I search for dolphins and sunfish for about an hour or so before it is time to get ready for work. The past two days have been so beautiful, that I haven’t wanted to be inside the boat at all during the day—for fear that I might miss something spectacular! Because of this, I haven’t had the chance to do as much writing as I would like. I tried using the laptop outside—but the glare is too great. It just doesn’t work! After a long and draining winter/spring, it feels so good to get recharged by the solar energy! It’s Thursday afternoon. We have completed almost 300 tows to sample scallops from Cape Hatteras to Cape Cod. Today will be our last full day at sea; we return to Woods Hole, MA early Friday morning. I am of course looking forward to getting back to land and eventually back home to North Carolina, but I am immensely grateful for this experience. During our introductory meeting at the start of the cruise, our ship was compared to “a city at sea”. I’ve thought about that a number of times. All the normal services provided by municipalities must be duplicated on board a ship: electricity for heating and cooling, fresh water for drinking and washing, food supplies to last for the duration of the cruise, waste disposal, emergency services, communications, even entertainment. Then too, this is a city on the move. It takes brainpower to know where we are and where we’re heading at every moment in time. And it takes mechanical power to keep us moving through the water. I would suggest that it also takes a considerable amount of people-power to keep this city-at-sea operating at its fullest capacity. And I’ve witnessed this sort of people-power consistently aboard the ALBATROSS IV the past 15 days. Organization, planning, and procedures govern nearly everything. Officers, crew, and scientists know what to do and what not to do, and all this works to achieve the overall goal of gathering the data necessary to continue this study of scallops that started back in 1975. But beyond merely following procedures, I’ve also witnessed something else among the individuals on board this vessel that makes work progress smoothly: simple courtesy. People are quick to offer a helping hand. “Thank you”, “Excuse me”, “Let me help you with that”, as well as unspoken gestures of consideration, are plentiful. Everyone seems fully aware that we are, literally, all in the same boat out here, and getting along is an important aspect of getting the job done. So, as I approach the end of this experience, I am grateful to all those who made it possible: the NOAA Teacher at Sea program and its administrators, as well as the officers, crew, and scientists aboard the ALBATROSS IV. Thank you all for the valuable work you do, and thank you for allowing me to be a small part of it. Science-wise, catches of scallops have been variable. Sometimes we’ve hauled in huge numbers; other times almost none. We’re still sorting and counting and measuring fish from every catch, and as we move back northward, a little east of our starting point now, the fish species have begun to change. We’ve even caught a few lobsters. I’ve been trained to do several different jobs so far. I’ve monitored the computer station while collecting the CTD data, determining salinity by lowering the device over the side that measures conductivity, temperature, and density within 5-10 meters of the bottom. I’ve also helped download the data from the inclinometer, which results in a graph showing the angle of the dredge relative to the bottom during the tow. 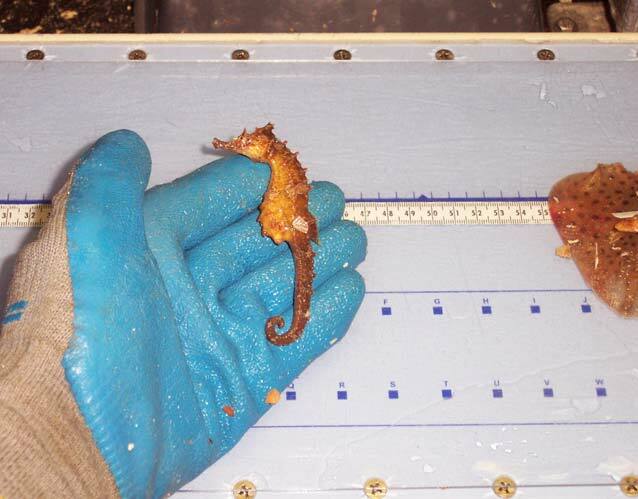 I’ve learned the procedures for measuring and collecting additional data on little skates. They’re the fish that look like stingrays. We measure, length, width, weight, and determine degree of sexual maturity. Now I’m doing the starfish count, every third tow. My job is to collect a random bucket full of the by-catch (the leftovers) after everything else countable has been removed, then sort, count, and weigh the starfish according to species. Sometimes the whole catch is mostly starfish, so there’s plenty to keep me busy. Sightings: This afternoon I saw the dorsal fins of two ocean sunfish (Mola mola). I would have assumed they were sharks, since all that was visible was the fin, but the fishermen said you could tell by the shape of the fin and the way it moved through the water. The Peterson Guide to Atlantic Coast Fishes says they’re among the largest of the marine bony fishes. (Whale sharks and basking sharks are larger, but sharks have cartilage instead of bony skeletons.) Sunfishes can be as large as 3 meters long and 3.3 meters tall, and they may weigh over two tons. Several days have passed since my last log entry. I’ve been making some hand-written notes, but they’re mostly about our encounter with the fringes of Tropical Storm Beryl and my re-encounter with seasickness. Everyone has been very understanding, and I’ve appreciated it. I’m feeling back to normal now. It’s almost halfway through my watch now, and I have a little down time. The day started with several stations that were close together, which kept us busy. Now the sampling stations are farther apart, and I’ve had time to work on some photographs of shells. Our catches turn up lots of interesting creatures. Some I recognize from my college invertebrate zoology course (oh, so many years ago!) Others I’ve only seen pictures of. There are occasional sea squirts, bulbous little creatures that squirt a stream of water when squeezed. We find an occasional “sea mouse”, a polychaete worm, bristly-looking on the backside and shaped sort of like, well, a mouse. Underneath you can see the segments. Hermit crabs are abundant; many of them simply abandon their shells when they’re dumped onto the deck. This is probably not a good survival strategy, since they get dumped back overboard only to drift slowly to the bottom without any protection at all. Oh well, most everything in the ocean is somebody else’s lunch anyway. We find other species of crabs as well. The larger ones are set aside and are sitting in a bucket which has seawater continually being pumped through it to keep them alive. I wonder whose lunch they’ll turn out to be? We’ve caught a few small dogfish sharks, under two feet in length. I’m told on some of the ground fish surveys they catch tons of them (literally). Considerably smaller were two needlefish, about 6 inches long and ••• inch wide. I find myself wondering things like, “What must it be like to be that small, living in this huge ocean?” Them I’m reminded of our little planet’s location in our galaxy, and the Milky Way’s tiny place in a universe with millions of other galaxies. OK. Humility is a good thing. Then too, I’m reminded that small is not always equivalent to unimportant. Do you like breathing? Well, consider that roughly 3 out of every 4 breaths you take come to you courtesy of the phytoplankton in the oceans of the world. There they are, soaking up the sunshine and the carbon dioxide and pumping out huge quantities of oxygen every single daylight hour. They’re microscopic, but their importance in the overall scheme of life on this planet is enormous. I suppose it would be helpful to remember, while we’re busy saving the whales, we should take care of the little guys too. But then, how would “Save the Plankton” look on a T-shirt or bumper sticker? On a more practical note, we’re due to reach our turn-around point in 5 more stations. We will have reached our southernmost latitude, which will put us due east of the North Carolina-Virginia border. Then we’ll begin making our way back up the coast, stopping at the stations in shallower waters. I flew to Boston from my home in western NC to take part in this Teacher at Sea experience. So this is the closest to home I’ll be for the next 12 days. I keep thinking I’m done with my log for the day and then something else happens. At station 99 we caught a seahorse! The depth was 24 fathoms, and I seriously doubt it was on the bottom, but when the dredge came up, there it was on deck. Sightings: The osprey was still here this morning, but as of late afternoon it was gone.